This is my new and improved earth battery running 4 ultra bright 10mm 28000 MCD LEDs. I am using a standard Joule Thief circuit wound (bifilar) on a ferrite toroid this time. An N3904 transistor, 1k resistor and a 2.3 volt, 10 Farad super capacitor. The earth battery is putting enough out now to not only run these leds, but also charge the cap as you will see when I disconnect it and bring it inside. I can run more. 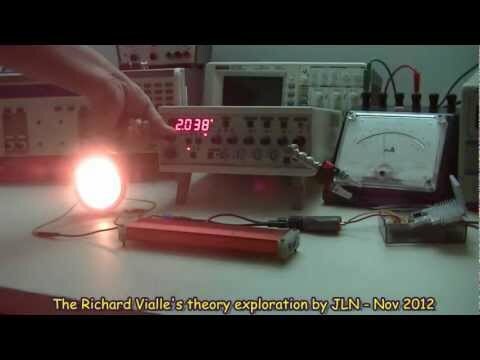 For more information, go to Overunitydotcom in the Joule Thief topic. Thanks.